Adria, the Slovenian manufacturer, is the only Continental giant that produces caravans specifically for the UK with an eye to large-volume sales. All of its caravans are approved by Britain’s National Caravan Council, the entry door is on the UK nearside, and each comes with a 10-year bodyshell integrity warranty. In addition, in Practical Caravan’s first two Owner Satisfaction Awards, the brand topped the tables: once for new caravans and once for pre-owned. That’s a ringing endorsement from the caravanning public. Adria’s reputation is for innovative design and affordable prices. Although its tourers may lack some of the equipment found as standard in British-built tourers, generous options packs often narrow the gap between the company’s models and their domestic rivals. 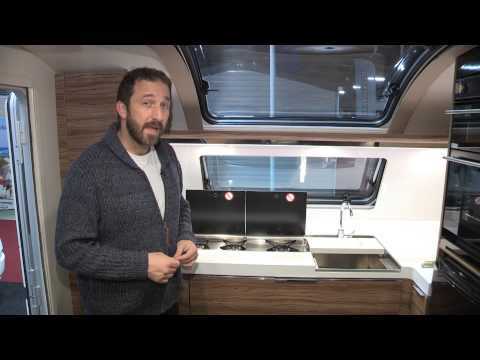 Adria produces three ranges for the UK, and we’re looking here at the top-flight Astella Glam Edition. Launched a couple of seasons ago, the Astella range was radically overhauled for 2014, garnering a longer name and given two models. First up is the Amazon, with Adria’s signature front kitchen, an L-shaped midships lounge, fixed twin beds and an end washroom. Then there’s the Rio Grande, which shares the same arrangement but with a fixed double bed, making it ideal for couples. It’s the latter we’re looking at here. The wide-body Adria Astella Glam Edition Rio Grande (2.45m) has been revamped to capitalise on the ‘glamping’ trend, and it’s certainly eye-catching. Several upmarket caravans were launched for 2014, but this Slovenian caravan stands apart from British rivals with its silver, polyester-skin exterior, sleek lines, and front and rear ABS panels. Given its width and overall weight (MTPLM 2000kg), you’ll need a Land Rover Discovery or other large 4x4 to tow this caravan comfortably, but we reckon it will appeal most to those who plan to site it on their favourite pitch as a seasonal tourer. The caravan's heavy-duty steadies are rather difficult to lower, because the winding nuts are tucked well beneath the caravan at the front and rear, making access unnecessarily awkward. Hatches for the Thetford toilet’s cassette and the drain pipes are on the offside, as are the water inlet, the battery box and the mains hook-up socket. There are also lockers that provide access to space under the front kitchen and, on the nearside, under the fixed double bed. An external gas point is near the front. The Adria Astella Glam Edition Rio Grande benefits from an opening panoramic sunroof (as provided in the Adora range), a silver exterior, chrome-effect grabhandles and stylish light clusters. It runs on an Al-Ko chassis, is fitted with an AKS stabiliser, and comes with clip-on wheel-cover inserts to protect your tyres from the sun. The Astella Pack of options includes alloy wheels, ATC trailer control system, a spare wheel with carrier and attractive roof rails. The Adria's interior is dramatically different from that of most caravans on the market, with hotel-style dark-wood veneer furniture, leather upholstery and chrome-look detailing. There’s an L-shaped sofa on the offside, and a two-seater on the nearside. The L-shaped seating faces a fixed-leg table with a high-gloss veneer. The table can be raised, lowered and slid fore and aft to make settling on the sofa easy. The lighting throughout is luxurious, with ambient LED spotlights to the sunroof surrounds and above the overhead lockers, but most interesting is the addition of a lamp on a chrome-effect hinged arm that swings out over the lounge. A swing-arm TV bracket is mounted to the bulkhead at the foot of the bed. This enables you to watch TV from either the lounge or the bedroom. Heating throughout the van is courtesy of Alde’s premium wet central-heating system, which boosts the Astella’s four-season credentials. The distinctive L-shaped kitchen is uniquely sited across the front of the Adria Astella Glam Edition Rio Grande. It has three in-line gas burners, as in the rest of Adria’s 2014 range, plus a 190-litre fridge and plenty of workspace. This unusual layout sets it apart from many of its upmarket counterparts. It’s very stylish, with cream work surface veneers and wide, soft-shut drawers with built-in cutlery partitions. The full-width washroom is another premium feature of this caravan. Its swivel-head toilet allows for plenty of legroom, and the salad bowl-style handbasin, with its big swan-neck tap, is both practical and stylish. A large mirror is mounted on the wall behind the basin, and abundant storage is available in the cupboard below. The van's generous separate walk-in shower cubicle is well-illuminated by a stylishly back-lit central pillar. Still, we would prefer to see a fully lined shower cubicle, rather than the partially lined one that’s fitted here. The Adria's bedroom is plush indeed, with a padded cream and chrome-effect headboard and twin lamps that, unfortunately, intrude on space for those who like to sit up and read in the evening. Because the caravan is so wide, however, you have a massive double bed, as well as plenty of room for getting to the rear washroom. The large double mattress is split, so you can raise the head of the bed for either occupant who wants to sit up. Simply elevate the cantilevered bed base manually for each mattress. The largest storage space in this caravan is under the fixed double bed, which is accessed simply by raising the bed base. This area can also be reached from outside. Storage arrangements in the kitchen are superb, the overhead locker space is bountiful, the wardrobe is generous and there’s a full dresser on the offside wall, opposite the double bed. A couple really could live full time in a caravan with this many options for stowing belongings. You’ll either love or hate the exterior and interior styling of the Adria Astella Glam Edition Rio Grande, and the layout with all its quirks. However, if you’ve got the tow car to tug it and the budget to buy one, we reckon you'll find few more appealing seasonal tourers on the market today.